Coconut oil brownies were inspired by one of my goals for this year: updating old, good, and maybe-forgotten-about recipes. There are a lot of those here because when I first started Cookie Madness it was basically a web log of experiments and new recipes rather than a carefully curated collection. To keep up with the times, I’ve had to forget about posting every day and am trying to post only recipes I’ve made multiple times, that were exceptionally good or that for whatever reason I feel strongly about. 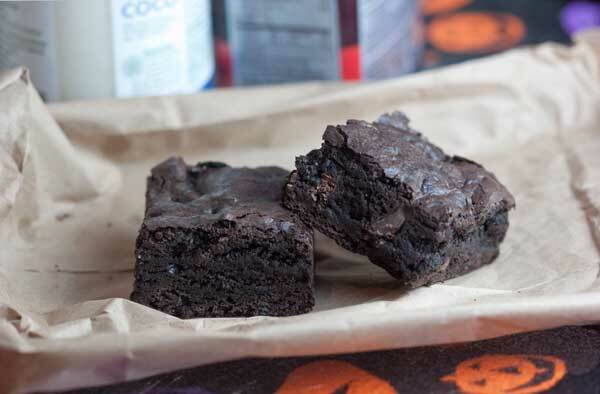 These coconut oil brownies meet all of those qualifications. When I first started making these reduced fat brownies I used a combination of butter and grapeseed oil, but now I use coconut oil, which is readily available and popular. The coconut oil brownies have a dense and sturdy texture (kind of like boxed brownies) and a ton of chocolate flavor. For me personally, they’re a little easier to eat because of the reduced fat content. I’m pretty sensitive to fat and don’t get as full and uncomfortable when I eat these as opposed to richer ones. They do appear to have a lot of sugar, but it’s offset by all the cocoa powder and flour, so the brownies aren’t radically sweet. The sugar does give them a great texture, so if you plan on monkeying around with the recipe you should take that into consideration and maybe try it as written first. I’m scared to tamper with this recipe anymore because I’ve found that when I make it just as written, it’s perfect. Making Coconut Oil Brownies involves a lot of gently stirring and scraping, so I use one tool – a heavy duty, heat resistant silicone scraper. I like the one I bought years ago from Pampered Chef. In fact, I liked it so much a bought a second. Preheat oven to 350 degrees F. Line an 8 inch metal pan with nonstick foil. In a large saucepan, melt the coconut oil and chocolate together over very low heat stirring gently so that chocolate doesn’t burn. When chocolate is melted, add cocoa powder and stir until smooth. In a mixing bowl, mix the eggs, egg white, sugar and vanilla (I do this with my scraper). Mix in the baking powder and the salt, then combine the egg mixture with the chocolate mixture and stir well. Add the flour and stir it in with the scraper. When flour is fully incorporated, make sure the batter is no longer warm and then stir in the chocolate chips. Batter will be thick and grainy. Transfer it to the pan and spread it evenly. Bake on center rack for 28-30 minutes or until brownies appear set. It will be quite obvious that they are done! Let cool completely on a rack or if you are impatient like I am, set the brownies in a shallow pan full of ice water to quick cool. Lift from pan and slice into squares or for a cleaner cut, chill for a few hours and then cut. I always chill mine before cutting, then serve at room temperature. I almost always use metal pans, but if you only have an 8 inch glass pan you could try that. It is usually recommended to reduce the baking temperature by 25 degrees when using a glass pan, so reduce temp to 325. This recipe looks great. I love baking with coconut oil when I can. Thanks for the feedback – maybe you’re right, better to make it as written! For anyone else interested in making brownies with coconut sugar, there’s a flourless coconut sugar brownie recipe making the rounds. You might want to try that one over this one. Megan, I couldn’t taste the coconut oil at all. Runner Girl, I use coconut sugar all the time and it’s not really anything like regular sugar. If you try it, the brownies will be COMPLETELY different. By all means, try it and experiment, but whatever you get will be a different brownie. For your experiment, I suggest halving the recipe and making it in a loaf pan so you won’t have to throw out too many ingredients. Good luck. These look great! I’m wondering about using coconut sugar – it’s more similar to brown sugar (but not as moist). I’ll let you know how it works out!